When it comes to grooming, men tend to spend a lot of time and money in only one area: shaving. It’s the one time we get to pamper ourselves and do something great for our skin. One of the best shaving accessories a man can get is a shaving brush. 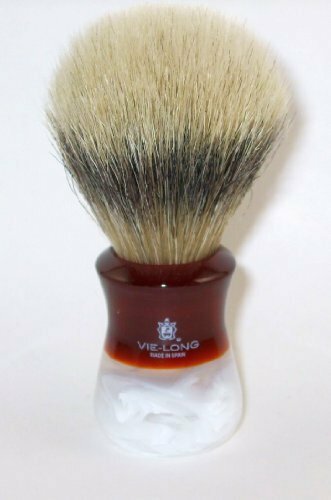 Shaving brushes are a thing of yesteryear that many still use today.They are a luxurious way of doing a rather annoying task and help us to get a super clean shave while taking care of our mug. While it may seem daunting at first, there are so many different brush options available, making it easy to find the perfect one for your skin. Instead of going the traditional route, you can make shaving an art and delve into the world of shaving brushes! While most guys don’t realize it, traditional shaving methods can be quite ineffective. Shaving cream alone doesn’t prepare your beard for a proper shave. Aerosol shaving creams only matte the facial hair. It actually pushes the hair down, making it much more difficult to get a close shave. This leads to harder scrapes of the razor, which results in rashes and ingrown hairs. 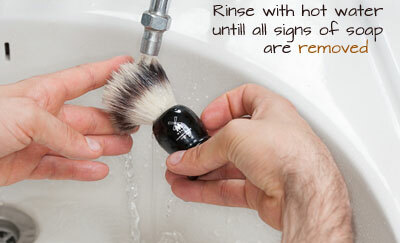 Shaving brushes work to stir the shaving soap and lift the hairs away from the skin. The hair will stand on end, allowing the razor to do its job. Not only that, but using the water and soap with a brush exfoliates the skin, leaving it much smoother. In the end, shaving brushes prepare the beard and skin for an ultra smooth shave. Plus, you get to use a cool looking retro tool in the process. Using a shaving brush can be a very fun process. While it’s not as quick as simply slapping on some shaving cream and going to town, the outcome is well worth it. The process may differ depending on the type of brush. For example, boar bristle brushes are more suited for solid soaps while badger brushes are great for creams. Either way, the brush should first be run under some hot water to prepare it. The extra water should then be shaken off. It can then be used to create a lather with the soap. Generally, a mug or dish is used to hold the soap and cream. It looks cool, while giving shavers a contained space to create a lather. Just whisk away at the soap to create a rich lather. Applying the soap to the face is the fun part. Some guys like to flick the brush on their face to make the hair stand up. Others like to use a massaging method. Using a combination of both methods will ensure that the hair separates from the face while giving you a gentle exfoliation. Either way, using the brush is fun process. Enjoy the sensation while preparing your skin for a close shave. It’s important to take great care of the brush to make it last. Proper care will ensure that the brush stays uncontaminated and effective with every use. The cleaning process is pretty simple. All it takes is a rinse under some hot water. However, it’s important that the rinse is thorough. All signs of soap should be removed. Afterwards, it should be hung upside down. This allows all of the water to drip off the bristles and dry effectively. The brush will stay clean and not become a breeding ground for bacteria. Getting a nifty stand will make storage and cleaning much simpler. Plus, it looks extra sophisticated sitting next to the sink. When it comes to style and material, there are numerous different choices in different price ranges. 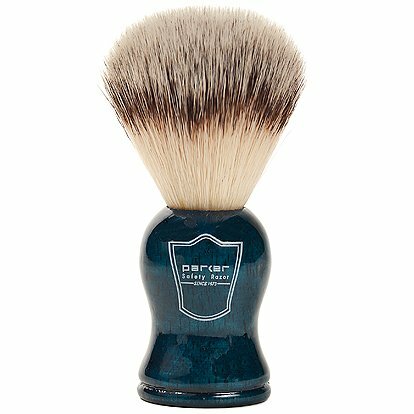 When choosing a shaving brush, it’s important to think about your skin and how you want the brush to affect it. Do you have sensitive skin? Then you may want to get a brush with softer bristles. Do you want a bit more exfoliation? A tougher bristle will be a better option to open up those pores. It really all depends on your skin and how you want to use the brush. Style and appearance is another thing to consider. Shaving brushes aren’t just an accessory, but also a statement piece. These sit on display next to the sink. Use it as an opportunity to show off a cool new tool! Shaving brushes come in a number of different styles, from modern to retro. If style is a huge factor, then you may end up paying a bit more for the brush. 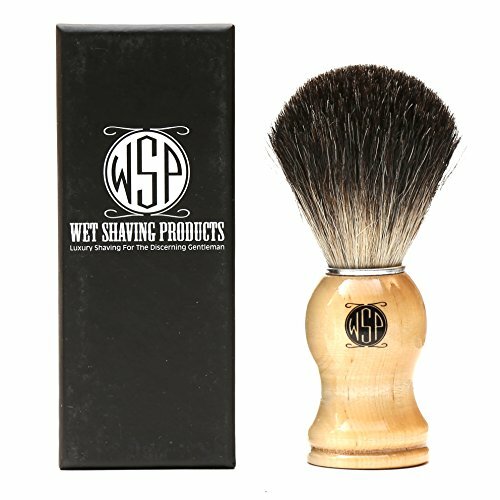 Price wise, shaving brushes can range anywhere from 10 or so bucks up to over a hundred dollars. This all depends on the materials and bristle density. Synthetic brushes are generally more affordable, but their quality can be evident upon using it. Furthermore, badger hair, bore hair, and horse hair brushes can vary on quality and price. Shaving brushes made of badger hair are some of the most effective and versatile. The soft bristles are great at generating a lather and holding water. They are soft enough for sensitive skin yet slightly tough to provide some exfoliation. It’s often considered the prime choice for those with sensitive skin, as the bristles are incredible soft. Some brushes are even silver tipped, which contains hair from the underbelly of the badger. Silver tipped brushes are the softest available. Badger hair is an overall great material to use for brushes, making it a popular choice among shavers. The price of a badger hair brush varies on the thickness and density of the brush. A very full brush will be on the higher end of the spectrum while thinner brushes are the most affordable. Furthermore, the price may vary based on craftsmanship. Handmade brushes offer a unique product for a price. These brushes can be used with a number of different styles and material of handle. While wood offers a traditional appearance, they can rot over time. Acrylic handles on the hand provide many style options with a much more staying power. Boar hair is a tougher shaving brush option. Brushes made from boar hair are a lot more stiff. They tend to provide a richer lather due to their stiffness. Additionally, they do wonders in terms of exfoliation. While the bristles do soften over time, boar hair will be noticeably more coarse when compared to a badger or horse hair brush. Those with thick beard hair can benefit from using this type of brush. A softer brush may be ineffective in massaging and moving the hair. The coarse bristles of a boar hair brush will prepare the hair for shaving by standing it up and softening it. Often considered the more rugged option, these brushes actually have to soaked in hot water for 10 minutes before each use. This makes the bristles slightly more flexible. While it may seem like a nuisance, the exfoliation they offer is well worth the wait. Also, these brushes tend to last quite a long time, despite their shedding. Synthetic hair is the best option for animal lovers. Consisting of artificial plastic hair, these brushes are much more economical and convenient. They are an all around great brush, similar in softness to that of badger hair. Synthetic brushes have slightly more stiffness than badger hair brushes, thus providing a bit more exfoliation. They are a great for the everyday man with average beard hair thickness. Price is one of the biggest advantages to synthetic hair brushes. Because they don’t consist of any forms of animal hair, they tend to be much cheaper. In fact, you can easily get a super thick brush for a very good price. These brushes also tend to last longer. They don’t shed as much and are really great about drying quickly. The synthetic material doesn’t absorb water, so the bristles aren’t damaged over time. They can also be made in a number of different styles to suit any man’s aesthetic. Brushes made from horse hair have the best of both worlds. They are a happy medium between a badger hair brush and a boar hair brush in terms of softness. They are best for those who want an even mount of softness and exfoliation. 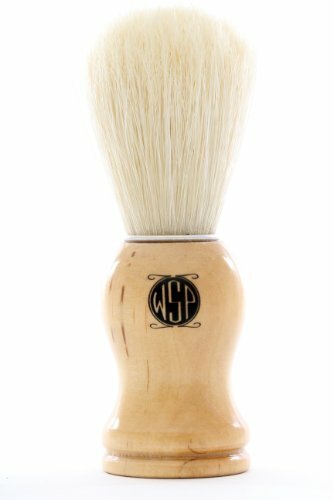 When it comes to stiffness, these bristles are less pliable than badger hair but not as stiff as boar hair, providing a great lather. One of the biggest downsides to horse hair brushes is their smell. While all animal hair brushes do have a hint of gamey scent to them, horse hair has a notoriously strong scent. That being said, the scent will eventually go away once the bristles absorb the scent of the soap. This usually occurs after a few days, making the initial scent only a minor problem.